Stand: That Australia develop a plan for the construction of the worlds most advanced high speed train network called The HyperTran. Background: Japan built its first bullet train in 1964. It carries 150 million people a year. The Australian people should accept no more delays to building our own high speed train network and we should take the matter into our own hands and get it started immediately. 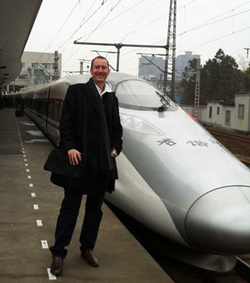 When I was in China earlier this year, I travelled between two major cities on a high speed train and it was the most enjoyable journey I’ve ever taken. The time before that I travelled on the Shanghai Maglev Train and sat back sipping my coffee whilst the speed topped 430km/h. I imagined myself riding to Canberra for the day to visit a gallery as I travelled with my 2000 fellow passengers at over 400 km/h in complete silence, safety and supreme comfort. This country has needed a High Speed Train Network for generations. The reason we don't have one today is more about a lack of leadership than it is about the high cost. This lack of leadership is also the reason why we won't get one anytime soon unless we take some determined action to get the job started. So far, all we have a High Speed Rail Report. You can read it here. After I read it I was left with two overriding conclusions. 1. The government isn't going to do it - it's been placed (stacked) in the too hard basket. 2. Even if they do, they'll choose the safe path using wheel-on-rail which is old technology. If we ever did decide to build something of this scale then we should play it safe and go with with the older, proven technology of wheel on rail - basically train tracks. It will take over 40 years to build. The speed should be capped at 300km/h (making it the slowest high speed rail network in the world). I believe this report is selling Australia short and that we should reject it and relook at the opportunity again with a Can Do Attitude and a vision to build ourselves the very best possible system. I propose we open-up the discussion and take a broader view and see if, after a national conversation on the subject we still come up with the same conclusion. The Wheel-on-rail (i.e. train tracks) were invented over 200 years ago. Sure they work but, are they still the best system? Are they a system which should carry us through the 21st century? I suggest not. Travelling on the MagLev in Shanghai was one of the most amazing experiences of my life. Topping 430km/h we seemed to be half floating, half flying. This by far represents the state of the art system in train technology. Why then isn't it the system our government is favouring. The main reason is because it's never been done before on this scale. I believe that should be exactly the reason that Australia does it! Not because it's easy or proven, but because it hard and revolutionary. The technology exists and we should use it and improve it. I have no doubt that as we implement the technology, we will continue to improve it and in the process develop dozens of patentable technologies which we can licence to other nations around the world. Video to the right was taken from a High High speed train in China (not the MagLev). Tunnelling is slow and expensive. In places it is necessary but by using a system of stauncions or eleveated columns much of the cost of tunnelling could be avoided and the speed of laying the platforms could be exponnentially increased. Right across China these massive columns stand and carry a vast network of trains and cars. The platforms are laid by massive machines which follow along and crane into place, huge prefabricatd sections. The speed with which this is achieved is breathtaking. One year I travelled along a transport corridor and saw no infastructure what-so-ever. The next I saw a fully completed rail system. The system Australia builds should push the limits of what's possible and what we as a nation are capable of achieving. It should re-evaluate the potential of Maglev technology as the most advanced system currently available. At least part of the network ( say 15%) should be powered by renewable energy sources and engineered such-that as the technology becomes available, more and more of the network is switched across to renewables. It should not be capped at 300km/h but should push the boundaries of what's possible and achieve the great speeds necessary to span the vast distances of our country.